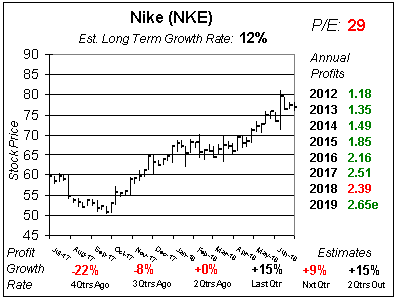 Nike (NKE) has been doing well with its online sales and expansion into China. 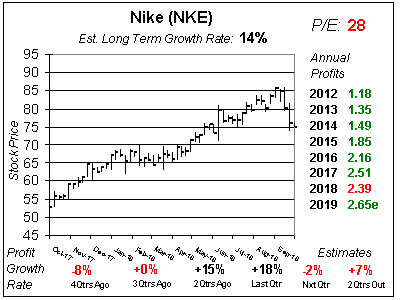 Let’s take a look at NKE and see if it’s too-high to buy. 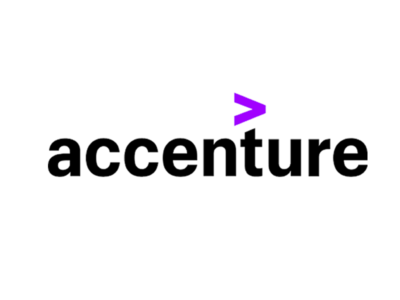 Accenture (ACN) is the company that large companies hire to get advice on business and technology. Here’s our first look at ACN stock. 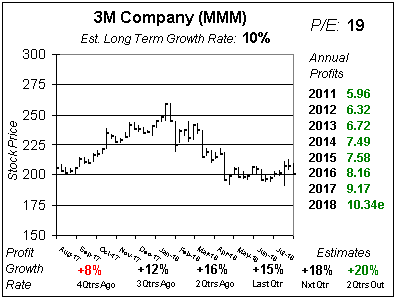 3M (MMM) just cut 2019 profit estimates and mentioned weakened demand from China. Now just 1% profit growth expected for 2019. 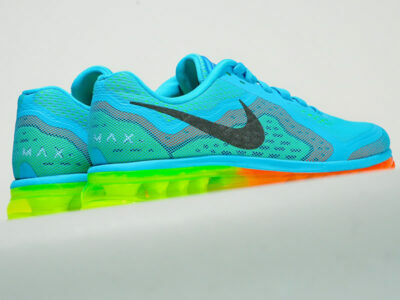 Nike is scoring big with its Digital platforms such as Nike.com and the Nike app. But with a rich valuation, is the good news already priced into the stock? 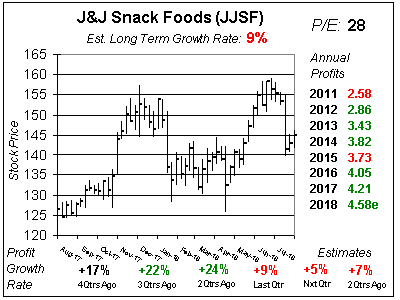 J&J Snack Foods (JJSF) is delivering poor results. Profits declined 11% last qtr. Yet this 9% grower still sells for a lofty 29 times 2019 earnings estimates. 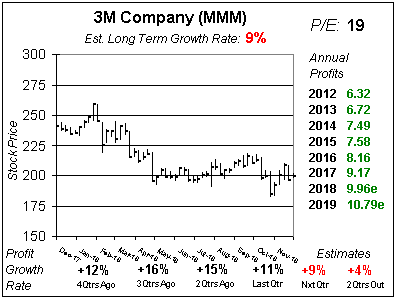 3M’s (MMM) 2019 profit estimates have declined from $11.49 to $11.42, $11.24 and $10.79 the last 4 qtrs, and that’s hurting the stock. 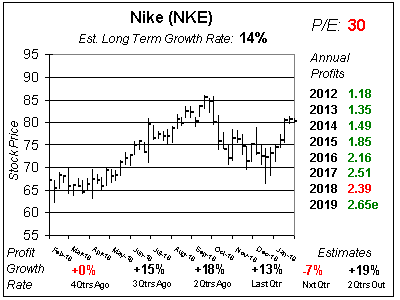 Nike (NKE) has this bad habit of beating qtrly profit estimates, then lowering next qtr’s estimate. I’m not a fan of that strategy. 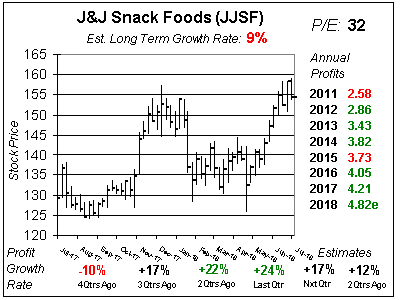 J&J Snack Foods (JJSF) isn’t a big name stock, but the quality of the company is supurb. JJSF just needs to come down a little before we buy. 3M (MMM) stock has had an amazing decade as investors were impressed with its high dividend yield. Now MMM has come back to earth. Nike (NKE) is one of the best stocks in the Dow this year as the return to sales growth in North American has boosted the stock to new highs. 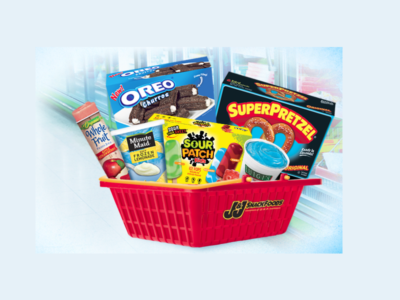 J&J Snack Foods (JJSF) is a food maker, with 20% of sales coming from soft-bake pretzels. JJSF’s gone from $30 to $150 during the past decade, here’s what Sharek thinks of it now.